Free signals require creating and funding an account using an IB link. I am going to try this service again. Unfortunately, I lost my patience a couple of months ago, and started to take (far) too much risk. So I lost money. It's not for nothing, to risk only 1%, like Mike says. I hope I'll manage to stick at it this time, and finally get some profits...! Feb 3, 2017 - 3 Stars I have to add something. I started with a small amount of money to trade. So, when you are also starting with a small capital, at least you have to make your stop loss value a bit smaller. Maybe you can test the stop loss values (which you receive from the signals) for you on a demo account first (and adjust them, until you get it right). I also noticed that, sometimes, the take profit value is not always being reached. That is NOT something I can blame 123FreeSignals for. I can imagine, one can't predict the 'take profit' numbers to the ....th number after the comma. That's just the working of the market. Maybe it's better to be glad you make a profit in the first place, but if you get the idea your profits will decrease again, you'd better stop and take your profits, even if it's less than you hoped for. And, last but not least: be PATIENT, and try to be not too greedy (or make this whole forex thing too important). It still remains a very unpredictable market. 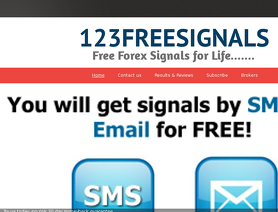 That being said, I really am still grateful with 123free signals. Of course, sometimes a trade goes wrong, Again, that's because of a sudden change in the market. But most of the time, their predictions are correct. Not into the exact numbers all of the time, like I said. But nevertheless correct. With a lot of patience, you most probably can earn a little on the side with them. Feb 1, 2017 - 3 Stars I still believe 123FreeSignals gives good signals. But I had to reduce the SL and TP levels, or my account would have been wiped out. So, is this a good signal provider? Yes, but you have to adapt it to your circumstances. It would be nice if new members could get this warning. I been with them 20 months and almost every month gives me profit. I think the people who leave 1 star reviews are jealous or stupid. If you follow Mike and use small risk as he advise then it is impossible to lose. Reply by Mike submitted Apr 25, 2017 How long have you been with us hobbo84? If you were with us during Feb and March 2017 you would have profited by almost +40%. How many signal performers can claim such profits (for a service that is free). There is no way you could have lost. Actually in FEBRUARY 2017 we did not have 1 losing trade, approx 25 trades and all closed without any loss. It was our first non loss month ever which was amazing for us and our clients. We always advise 2% risk per trade, yes some of our SL's are big at times but we always give better than 1:1 reward:risk. And see the comment below, as long as you use proper risk management with us you will profit. We would love to learn more as it sound like you are not using our signals properly unfortunately. Please learn to think and read more closely instead of making false accusations again. Your first round was in the forums when you decided that asking of anyone had a negative opinion and got no reply within an hour meant that negative opinions were being blocked. You then "proved" the point when you misinterpreted the standard forum message about a post being caught in moderation being a message saying the post "was deleted because I posted the truth". Your original 1 Star review for 123 Signals was never deleted. Instead, it was pushed down the page a little way by 2 other 1 star reviews submitted after yours. Your original review along with the company representative's reply has now been appended to this review. Reviews get pushed down the page as new ones come in for every reviewed company. How you can interpret this as deletion is a mystery to us. When proving your claim is the best simple and professional way why are you so keen to issue me a conduct certificate. Because that way you can shift the focus and mislead people? I was angry after seeing your repeated lies but it has nothing to do with the validity of my review(Or prove other way). You want FPA to remove me so that you can get away with your lies? I saw someone else also reviewed you and exposed your lies.We both got almost same result where I think he included Gold signals when I calculated them separately. Jun 1, 2017 - 1 Star This is a reply to the company's reply to my review. I don't know how I can add them.So only add the comment below. Hello Mike,I don't want to lie like you.I admit that I was so furious after seeing your perpetuating lies and my language was not decent after seeing your immature unprofessional approach and denying of facts and data.I think FPA is all about trading and wouldn't let a liar like you to slip away. The review I have written is unbiased and honest. Prove me wrong rather than using Tu Quoque fallacy.I can back up every single thing I said in the review.Can you?.I will be very happy if you can prove anything I said in the review is wrong or what you claim is true. I have been using there signals from March 2016.My account was in draw down at the end of year where Mike claims his signals made 100% return in 2016.I can't say much about this as I didn't follow him for the first three month of the year.What I can say is end of 2016 was terrible. 2017 Started good with a positive January and nice February.From march the signals started to perform bad again. A few days ago I contacted Mike and told him about my concern about the poor performance. He agreed FX signals are performing bad but claimed Gold signals covers some of the losses.He also claimed Gold signals which started around Feb 2017 made a profit of 10% until may and FX signals are break even from March to may.That was the beginning where our relation started to become bad because HE WAS JUST LYING for sure. I spent hours going through each and every email he sent regarding the signal and update.I created an excel with each and every Gold signal and it's result.I didn't use my entry as I thought slippage might be a major factor and it will be unfair for him, instead I tracked using the best entry (He provides a 10 pip entry range for the market orders for FX and $1 range for gold) from his signals and I used his update for the result calculation(please note that the slippage will only favor him).I used my own closing price to calculate the result ONLY in occasions where he never send an update for obvious reason.fair way to calculate right? I send him the detailed excel and the Gold profit was only 4.03 risking a 2% per trade.But he claimed 10% and when I told him that's not the case ,he was stubbornly saying 10% is what he has on his head.He tried to counter my excel by saying irrational points and I replied him back with screen shot of his email.For example a Gold trade with SL 1300pips and TP 1600 pips away hit TP which I recorded as positive 2.5%(2.46 is the accurate one) in the excel where he claims the trade gave a return of 4% risking 2%.I am yet to understand the mathematics behind it.It was clear that he was manipulating the result. FX Result risking a 2% per trade are: March ( -1.3),April (- 7.3) and untill 27May (-9).That means FX result from march until 27 May was negetive 17.6 where he claims it was at break even.When I send him the detailed spreadsheet all he told me was that he had a client who told him the results are at break even.What a professional reply.I challenged him to prove me wrong many times (in similar way I send spreadsheet and screen shot of his emails) but all he was doing was saying the same client's breakeven story again and again. It is very clear that Mike was manipulating results and spreading blatant lies. This also makes me think that his claim saying 100% return in 2016 is just another lie. (I don't have proof for this). Reply by Mike submitted Jun 2, 2017 Kiran has admitted in his new comment above that he used unsuitable language. However he never once apologised for using such indecent and HOMOPHOBIC language against our employees. I signed up for the signals from 123FreeSignals in August 2016. They were actually profitable from September to Marts, however with April yielding -7.9 and May -12.8 they are actually down more than 7% over the last 9 month. There will be good times and bad times, but misrepresenting your results is not OK. I have written 123FreeSignals about the issue but haven't received an answer. They did acknowledge the reception of my e-mails though. * The results are calculated from the signals sent and NOT from my personal entries and exits. Entry signals are given either as pending orders or as an interval (e.g. SELL NZDUSD 0.6990 - 0.7000). In the latter case the middle in used - i.e. 0.6995. The results are based on 2% risk per trade (as recommended). Spreads and commissions are set to 0. Trades are booked in the month they are opened. We sent you an email a few weeks ago detailing the difference. We admitted an error was made on the website (we do not update the website but is done by a 3rd party) for October and that will be corrected once our website admin updates our site. All other results are correct. We have not added in remainder of April or May results yet. March was profitable thanks to the GOLD signals, Feb was +28% and some clients even achieved closer to +40%. We have added GOLD & OIL results as they were part of the signals service. Also December we closed the EURCHF at end of the month to give us approx breakeven. Please check your email that you should have received in May and you will see where the difference. I am still happy with this service. Of course, it is not a holly grail, but a very profitable service for serious traders. He has drawdown periods, sometimes 2 or 3 months, but than normally very good months with high profits. It is very important to follow the signals over a longer time period. There is no guarantee in forex, but I am sure that following the signals a whole year, I can make a very good ROI. For me the best provider. Nov 27, 2015 - 5 Stars After almot 9 months of trading with this provider, here an update: I think that 123FreeSignals.com is the real deal. I can confirm my 5 stars-Rating. Following the 2% risk per trade, the results are really amazing. And easy to follow, at least for european-traders, in my case the only problem is that new signals are sent at 3 a.m... But I can say that this provider is the best I ever tried. 2015-02-06 5Star Wow! What a start with this provider! 4 trades in a row with excelent profit. Clear signals with tight stops and good Risk/Reward (as I have seen most of the signals much better than 1:1). I tested almost hundreds of signal providers, most of them showing fantastic track records, but normally when I started, all of them only produced losses. 123freesignals seems to be different, of course, I have to follow more time, but I am quite confident that finally I have found a profitable signal provider. And the best: It is free using the recommended brokers. I will update the results in the near future. I'D GIVE THAT BROKERAGE WIDE BERTH BECAUSE OF HAVING A TRADER LIKE MIKE AS AN EXAMPLE OF HIS COMPANY? MY OPINION OF THIS GUY WITH THE PROBLEM HE WAS TELLING THE TOTAL TRUTH X TRUTH AND THAT MIKE GUY FROM 123 FREE SIGNALS IS LYING THROUGH HIS TEETH? JUST COVERING HIS LONELY ARSE THAT'S HANGING OUT THE WINDOW <> BECAUSE HE CAN'T DO HIS JOB IN ANY PROFESSIONAL MANNER? I CAN SPOT A LIAR A MILE OFF ESPECIALLY WHEN HE IS TRYING TO COVER HIS ERROR'S AND HE HAD TO DO SOMETHING IN RESPONSE TO THE BAD REVIEW HE RECEIVED? HE WON'T LAST? NONE OF HIS KIND DO? HE MIGHT FOOL SOME OF THE PEOPLE SOME OF THE TIME BUT HE CAN'T GET AWAY WITH IT TRYING TO FOOL EVERY ONE, WAKE UP MIKE YOUR A "SHOT DUCK"
I'D GIVE HIM HIS WALKING PAPERS AND THE BOOT? I CAN SPOT A "CON MAN" EVEN ON THIS FORUM OR FROM THE OTHER SIDE OF THE PLANET? THEY ALL FALTER AND EVENTUALLY CRASH! Very interesting choice of words and review. Are you one of our clients? I don't see your name anywhere in our client list? And I don't understand what you are talking about? Error's, con man? Have you contacted or spoke to me or anyone at 123freesignals personally? I have now completed my 5th week and the last 2 weeks have been profitable so perhaps my first 3 losing weeks were just a blip. I have found Mike at 123 will always reply to messages and is good to deal with. Will keep you posted. Sep 9, 2016 - No Rating I just completed 3 weeks with this service and only had one winning trade with quite a few losers. I hope that it was just a blip because of August holidays and will see if it gets better. Reply to Mike: My question is why did it take you so long to respond to me here on this forum? We've already talked about these issues by email in August and you recognized YOUR MISTAKES and even made YOUR APOLOGIES. Now you are telling another story. I'm an honest FPA member for those who know me well and i use to denounce scams here or in other forums, so why should i lie about your bad customer service? I still maintain what i said before. I sent you a message via your website 9 or 10 days (and not 3 days as you said) before you emailed me and you replied only after seeing my post on this forum. I never got a damned single reply from you before. I tried all different ways to join you but no reply either via your contact email message or live chat or anywhere else. Again you emailed me only the next day after i posted a comment here on FPA forum. Now i read your signal results are bad based on the last comment on this thread. Everybody reading here will make his own decision but personally i don't recommend your signal as i see you are not a trustworthy person!!! Aug 25, 2016 - 2 Stars I read almost only positive reviews here. Personally i wanted to try this signal but i won't do it because they are not responsive at all. If you have problems or questions, don't count on them to reply to you. I emailed them many times via their website or directly by email, i also used their live chat in their website but i never got a damned single reply from them. Maybe their signals produce good results, i don't know? but they have a very bad customer service. I don't waste my time here! Reply by Mike submitted Sep 13, 2016 Thanks for the comments. In response, this person has given us 2 stars based on the fact he has never used our system, our signals or our customer service. 2. We refused his Twitter Follow request as he was a not a client and it is protected and reserved for clients only to receive their signals. 3. We never received his Live chat messages. We asked the admins of the live chat feature who told us sometimes messages may not save/transfer but the truth is we never saw them. It's impossible for us to reply to something we haven't seen! Our customer service is always excellent, we reply almost immediately to customers/clients, via email, twitter etc. Look below and everyone comments on how helpful and honest we are. I don't think this person can comment based on 1 email. Yes sometimes we take time to reply to potential customers but that is because we always put our current clients and signals first. We are here to make our current customers happy and make them money, that's our number 1 priority. That is why we run the service practically free. Thanks again to all the real customers below who have given us excellent reviews. As we have almost 200 clients using us daily we obviously are trustworthy and honest. Please read the comments below from people who have using us daily for months. They are comments from people using us day to day, not someone who sent us 1-2 email/chat requests and got a delayed reply (which we have explained the reasons why!). And good news is that trading is September is going good and we now running at about +10% with no losing trades in over 2 weeks. And don't forget we are 100% FREE for people who want to use us.. The awesomest service yet. I did make a 10% on a single trade itself though Mike does suggest to maintain a 2% risk and proper money management, so it was entirely my risk to achieve that 10% and sound money management is solely an individual's responsibility. The signals are well analyzed and I can see from the results that I am getting, and I am very happy with it and I just hope they don't deviate from this streak and method and continue the good work. There are some wins and there are some losses, but overall the end result turns out to be really good. And I hope they are here for a really long time and continue the good performance, because the longer they are here, the longer I am with them. Keep up with the good work.